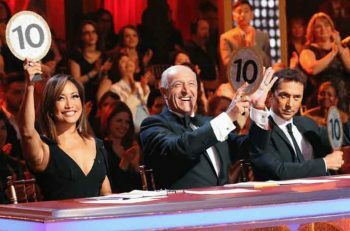 Dancing With The Stars Recap: Who was eliminated from Season 27 in Week 2? The second week of competition on Season 27 of Dancing With The Stars saw the ballroom fly from New York City to Las Vegas. Seriously. Even the Blue Man Group was there. But sadly, one couple would not make it to another week. Before the results, we have to talk about Tinashe and Brandon. This couple easily had the best dance of the night, scoring 26 out of 30 for their cha-cha. They were solid in their speed and precision and their music choice was not too bad either. Meanwhile, “Grocery Store Joe” and Jenna were the worst of the night by far. They scored an 18 out of 30 for their jazz routine and I’m surprised it wasn’t lower. Now, Joe did improve from the week one but it was the bottom of the barrel. I’m surprised he was not in danger of going home last night. After another night of competition, hosts Tom Bergeron and Erin Andrews revealed two couples in jeopardy. Danelle and Artem and John and Emma were both given the ominous red light and were in danger of leaving. Tom revealed that Danelle and Artem had the fewest votes and were the second couple to say goodbye to the ballroom this season. “It’s been fun,” Umstead said of her time on the show. Dancing With The Stars airs Mondays on ABC at 8/7c.